The Art of 'Killing': How Much Truth Comes from the Lie that Tells the Truth? Editor's Note: While the title of the film that we discuss here is The Act of Killing, the header of the article is intentionally "The Art of 'Killing'..."The quotes around "Killing" refer to the film itself, while "Art" comments on what's discussed in the article—that the killers not only took up the filmmakers' suggestion that they re-enact their atrocities for the camera, but they doubled-down on that suggestion and created a full-fledged theatrical and cinematic extravaganza, thus sensationalizing their crimes as art. What's more, as killers, they took their cues from another art form: Hollywood cinema. Before he made his film The Act of Killing, Joshua Oppenheimer interviewed survivors of Indonesia's bloody "Transition"—the failed military coup of 1965 and the brutal anti-Communist purges that followed—for an exposé on their culture of fear. Police shut down each meeting. With fear of reprisals, Oppenheimer asked the survivors if they should stop filming. The survivors opposed unanimously, but volunteered a solution: Film the killers, and the police won't stop you. "Begin with my next-door neighbor, the man who killed my aunt," one survivor suggested. "He will appear to be proud. Film that and the audience will see why we are afraid." After the failed coup, the Indonesian Army began a campaign of political apartheid. They paid street thugs and gangsters to rid the country of the National Communist Party (PKI), whom they blamed for the coup. There were no official trials to prove political affiliations, just semi-private assassinations. The men who carried out the killings have been glorified in national media as heroes. Even today, they appear on talk shows, have political influence, and boast loudly about their murders to anyone who'll hear—including the families of the nameless victims they left on riverbanks and in ditches five decades ago. The most commonly cited death toll is 500,000, but accurate numbers are hard to tally. It's impossible to say the campaign has ended, since the political class that sanctioned it did so to gain power. And both power and its attainment are limitless things. Corruption persists in Indonesia. In February 2004, Oppenheimer filmed two killers who took him to a river. During the Transition, these two men would drive a busload of internees from the military concentration camp to a riverbank every night, behead the passengers and throw the bodies in the water. "After they showed us how they'd done it, one of them took a small camera out of his pocket and asked my sound man, ‘Would you mind taking a picture of us to remember this day?' and the two posed, giving the thumbs up and "V" for victory. I went home with that material thinking, I have to make a film that adequately attempts to understand this." Errol Morris, an executive producer on The Act of Killing, made his 2008 documentary Standard Operating Procedure in response to the photos depicting the torture and humiliation of detainees at Abu Ghraib prison. He viewed those images with an exposé quality. "Standard Operating Procedure evidences a moment in which people want to remember themselves while torturing someone," says Oppenheimer. "Errol saw the pictures as confessions of a whistleblower. The Act of Killing is an attempt to understand an entire regime that did something similar; it wasn't just one person." Oppenheimer spoke to 41 perpetrators and took each of them to the scene of their murders to act out what they'd done. With cameras rolling, they'd lament, "Oh, I should have brought a machete, and friends to play victims." But Anwar, one of the subjects in The Act of Killing, was the only man who returned to the roof where he'd killed hundreds, and neither lamented nor wished for co-conspirators. Instead, he danced. "Unlike the other 40 perpetrators, his pain was somehow close to the surface," Oppenheimer observes. "When he goes out on the roof, he sighs; it's like there's a stone in his shoe. He says, ‘I dance to forget these horrors, and so I'm a good dancer.' And I'm wondering how this must look to him." These killers are a vainglorious bunch. Anwar's hair is dyed black, his attire is carefully chosen, his company is conspicuous; he is a celebrity war criminal. For five decades, Anwar has suppressed his conscience and any urge to conceal his part in the murders—the shame typically associated with crime is in conflict with the state media's celebration. Demonstrating a feeling other than pride would suggest he wasn't on the national bandwagon. And anyway, who says he wants to demur? He loves the attention. As The Act of Killing ultimately reveals, Anwar's humanity is his liberator and his punisher, but that denouement entails a lot of excavation. What Oppenheimer cannot do is discuss the murders in a critical tone, lest he risk looking like an objector—which means there's more at stake than Anwar's ego. Fearing Anwar would see the footage of him on the roof and call the shooting off (or worse), Oppenheimer assigned a production manager to stand by at the Jakarta airport with money and the crew's luggage, in case the filmmaking team had to make a quick getaway. Oppenheimer says it was the only time in the process he felt genuinely afraid. "Anwar watched the footage of himself and was disturbed, still not acknowledging what this means," the filmmaker recalls. "To admit it looks bad is to admit it was bad, and he's never been forced to do that. So he displaces the discomfort onto his clothes, and his acting. I realized that if I gave [the perpetrators] a way to act it out, to dramatize it in whatever way they wish, and I filmed the process and combined it with the re-enactments, we could create a kind of documentary of the imagination, rather that a documentary of their everyday lives, that allows me to see how they live with what they did and how they want the society and the world to see them." Anwar invites Ari, an old partner in crime, to film his scenes with him. Ari has been living abroad with his wife and teenage daughter, and unlike the other perpetrators we hear from, he's got a more sanguine, worldly view. Perverting Napoleon, he says, "War crimes are written by the victors." The last thing you expect from anyone in this story of state-sanctioned slaughter is moral relativism, but he continues: "Killing is the worst thing you can do. If you're paid for it, do it. You just need a good excuse." "Their government provides the excuse and they cling to it because it allows them to live with what they've done," Oppenheimer notes. "The justification of genocide is celebration, especially when they're insecure about what they've done. The irony is that the boasting—which I saw as a symptom of impunity—was in fact a sign of humanity." All of this suggests these men have been "acting" for some time. So then why give them high-class art therapy? The perpetrators have a national media boosting their violence as liberation; they have TV talk shows applauding their war crimes; they hold high-ranking offices and live like glitterati. How much more privilege can they enjoy? Is The Act of Killing trying to dole out punishment or reward? "There is no catharsis," Oppenheimer explains. In one of Anwar's scenes, he plays the victim. "I understood instinctively that the dramatization of the killings was a kind of running away," Oppenheimer maintains. "They would never dramatize it if they understood it was crime. It was almost an anti-therapeutic process. If I'd been looking for Anwar's catharsis, I would have heard him say, ‘I feel what my victims felt' and [I would have] said ‘Yes!' and it would have been sentimental." But that's not what Oppenheimer did: "No, you don't feel what they felt. They believed they were going to die," he says. The moment is as close to punishment as we see, and yet provides little resolution. What Oppenheimer understood when he was filming this scene was that we might want to pelt Anwar with stones but it wouldn't get us anywhere. "These men escaped justice but not punishment," Oppenheimer maintains. "That final picture of Ari staring into the mirror—that emptiness is a kind of damnation. It's an emptiness that's there from the beginning. Ari enters saying, ‘What we did was wrong and I know it.'" It's as if Oppenheimer is reminding us why Alain Resnais made Night and Fog, one of the earliest documentaries about the Holocaust: There is no bottom to this; it is unquantifiable. The footage that frames The Act of Killing is a high-gloss song-and-dance around a waterfall. Girls sway in dreamy light, and chained zombies thank Anwar for killing them. "Anwar came up with the waterfall dance right after playing the victim, and I think as a response to it." Oppenheimer explains. "It feels like a desperate act to put this right. He thinks it's beautiful but it's a lie, because it can't be beautiful and true at the same time." 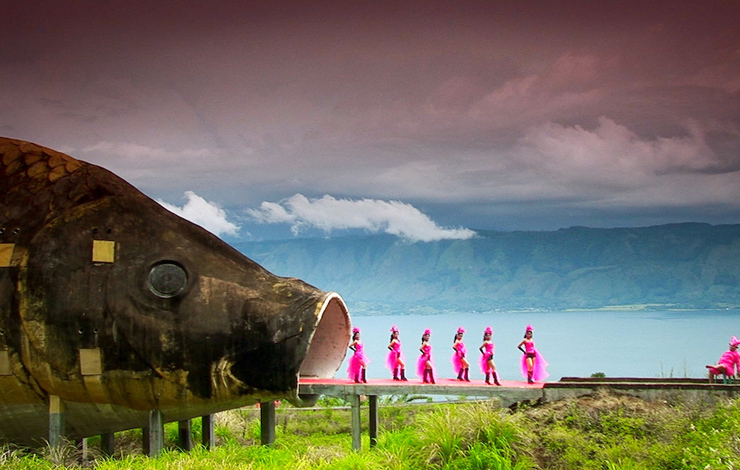 The Act of Killing opens July 19 through Drafthouse Films. Sara Vizcarrando is editrix of the release calendar at Rotten Tomatoes; a film studies instructor; and a blogger for http://movieswithbutter.com.